I think we all know that cleaning is not rocket science, I mean, I don’t know about you, but I was forced to clean at a pretty early age ( if you weren’t, lucky you). By the time I was 7, my mom was bellowing at me to clean my room from across the house. At which point I would stand in my doorway, looking lost at the piles strewn across my bedroom floor wondering where to start. I’ve certainly come a long way since then and I’m actually incredibly organized. So organized, that many of my friends have asked me to help them organize their homes. Organization and planning really applies to almost anything you do, cleaning is no exception. Here are some ways you can work efficiently and effectively, which will make your life a whole heck of a lot easier so you can get your job done much more quickly and effortlessly. Often times, your clients will have all of those supplies, but don’t get caught needing something like a toilet brush and having nothing to use. A good idea is to keep the disposable ones in that bag, because I came across a toilet brush that probably had a host of lord knows what living in it, and well, you get the point. I always bring my bag in with me, just in case, and I usually need something out of it. Typically I will use the client supplies if they have it there. But I often find what I have is going to do a better job. The reason I keep my things in a canvas bag, is it’s easy to tote around the house with me as I’m working, it helps alleviate running back and forth for supplies. Caddies work as well, but I like something I can sling over my shoulder, especially if I’m carrying laundry or anything else in my hands. This is very important. Unless you are swapping out clean sheets and towels, and taking them with you to launder, or leaving them for the client to launder, this is the thing that will take the most time. As soon as I walk into an Airbnb, I am stripping beds and piling whatever laundry has to be done by the washer. I always set it to the fastest cycle, and I set a timer on my phone so I can swap it out as soon as it is done. Something else I learned to do whenever possible, is to drape sheets to dry on chairs (inside or outside if it’s warm) on whatever you can find. This helps if you have multiple bedrooms and it will cut down on the amount of time you are drying laundry. Just make sure that whatever you are drying it on is clean of course, and that moisture won’t damage it. Chairs and barstools are great for this. I always like to knock out the harder rooms first, and these tend to be the harder rooms to work on. If you have dishes to run in the dishwasher, this should be the next thing you get going. I absolutely hate bathrooms, so my methodology here is to just get them out of the way because I don’t like them. I take my bathroom cleaners and hit the bathtubs, toilets and sinks with the cleaners, then I work from back of the house or apartment to front, or top to bottom floor. When I’m done cleaning the bathrooms, then I go back with my wet swifter and clean my bathroom floors. I never use the same swifter or mop that I have used in a bathroom on other floors in the house. Bathrooms have a lot of bacteria that you don’t want to be spreading throughout the rest of the house. I then move on to the kitchen. I like to use my Clorox wipes in here, but just to be clear, if you have sponges that you have used in the bathroom, keep these separate from others that you are using. You obviously do not want to clean other surfaces in the house with anything you have used in the bathroom. I keep my cleaning tools separated in bags so I know what is what, then they are laundered as needed. The insides of microwaves and refrigerators etc. The nice thing about cleaning Airbnb’s, is that they get cleaned so often, that there really isn’t a chance for things like soap scum to buildup, or for anything really, to get that dirty. However, make sure you are thorough. Don’t leave food scraps lingering around in various places in the kitchen for the next guest. Take the extra steps of opening up the oven and making sure it’s clean. Talk to your client about what they want to do about food left in the refrigerator. They will let you know what they expect you to do with it. Some people want it completely empty, some will say leave things that are unopened, others will say leave everything for the next guests. Now tidy it up inside. Throw away any leftovers from restaurants, that’s universally something that gets tossed. While generally speaking, I like to work from top to bottom if I have multiple floors. What I really mean by this, is clean anything upwards first, and work your way down to the floors. Think about it. You are cleaning a kitchen, you’ve wiped down all the appliances and the counters. You should then move on to mop the floor. This isn’t a big deal, but when you have to backtrack like this, it wastes time and it’s frustrating! I’ve kicked myself a few times when I’ve missed something that I didn’t pay attention to initially. The bottom is clearly going to be the floors. If I have any one thing I want to emphasize here, its floors. Do not skip floors. Just don’t. These are just little things that I learned from others, and things I learned the hard way. If you find something that works for you, do it, and stick with it! Getting your own little routine in place will make you work much more efficiently. This is good for you, and good for your clients. About the Author: Lisa is a professional Airbnb cleaner located in Denver, Colorado. To view Lisa’s profile or to book Lisa for your next short term rental cleaning, visit her profile or find an Airbnb cleaner in your area. 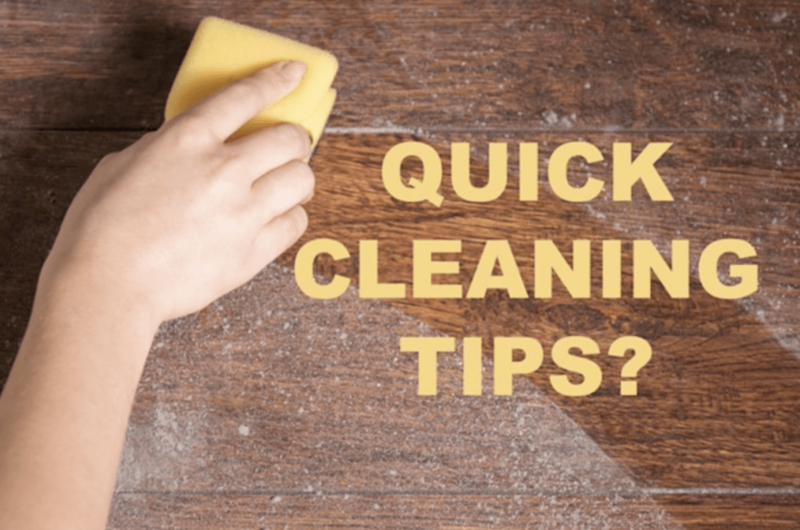 Previous Post The Top 6 Things You Should Be Cleaning But Probably Aren't! Next Post The Top 5 Cleaning Products You Should Not Live Without!